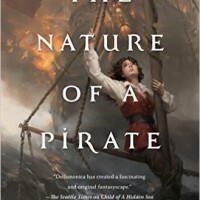 Most of you probably know that The Nature of a Pirate is on the ballot for the Aurora Award this year; voting is open now, and if you’re a member of CSFFA I urge you to get a ballot in, to support your favorite work by Canadian authors, pro and fan (as well as fan organizers, musicians, and visual artists!) working in all our beloved speculative genres. Winning the Aurora for best novel last year for A Daughter of No Nation , in tandem with Kelly winning Best Short Fiction for her “Waters of Versailles ,” was one of the great thrills of a magical year. I am thrilled and blessed to be on the ballot again. And soon we are headed off to Finland, and Worldcon, for even more magic. As I write these words I am well and truly settled into life in Toronto—it has been four years! But when I embarked on the Hidden Sea Tales trilogy, the question of where my home would be was very much in the air. 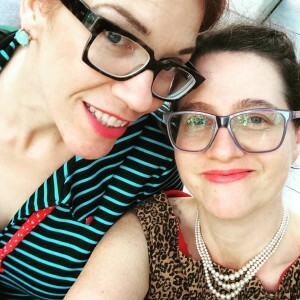 We were eager to move east, Kelly and I, but couldn’t see a way to do it: there were so many wonderful things and people tying us to Vancouver. I was in the weird lucky position of being somewhere great, yet suspecting that there was someplace even better. When we went it was sudden, and intense—a big leap, not without risk–and I’m so grateful that instinct to jump proved to be the right one. The old proverb home is where the heart is goes back so far it has been attributed, provisionally, to Pliny the Elder, a first century Roman scholar who really made the best of having Plinius for a middle name. It’s one of those two-edged aphorisms. It can mean home is where any sensible person wants to be, because of their attachment to the comforts and beloved people therein. Or it can mean any old pile of bricks and mortar place will take on the sentimental glow of a home if the ones you love are there. Both definitions contain within them the idea that a home embodies an ideal of safety, comfort, and affection. But what if the heart lies in two places? This may be slightly more of a thing nowadays than it used to be. Our population is more mobile, and it’s not an uncommon phenomenon to have partners and jobs in differing cities. Sometimes people fall in love without having met in person. Sure, people were always being separated by war or work or trade missions—that part’s not new–but communications technology makes staying connected more feasible, so long distance relationships have proliferated in new ways. I am something of a procedural mystery maniac, and one of my recent obsessions has been a show called Shetland , brought to us by the grace of Netflix and the BBC. It’s set in the Shetland Islands (which Google Maps can confirm is exceeding freaking remote) and while the main hub of the action is the bustling 7500-soul metropolis of Lerwick, there’s an episode that takes place out on Fair Isle, an island with under a hundred people. For anyone who’s read Child of a Hidden Sea and the rest of the trilogy, it should be no surprise that this hits my sweet spot. Shetland is about a community of interlocked islands and the tiny subculture flourishing there. A big subtextual concern within the show is the idea of home, of place–of living in a locale where your social opportunities and your geography are so very bounded, and where every young person who leaves is an incalculable loss to the community. It’s very nearly a portal fantasy with murder. One of the things about portal fantasies–a subgenre I absolutely love–is they tend to offer up these neatly bounded sojourns. The heroes of these novels go to the magical enchanted land, as my Sophie Hansa has gone to Stormwrack. They have an adventure, they upset the local balance of power, sometimes they see Aslan die a horrible death… and then they come home. If they have an ongoing relationship with that other world, it is somehow tidy, characterized by intermittent visits. There’s a sort of general assumption that these characters get a taste of magic, achieve character growth, level up… and then get back to the business of living in the real world. For Sophie, and to a lesser extent her younger brother Bram, the magical enchanted land is, among other things, a scientific discovery. Stormwrack is a research opportunity, a possible avenue into better understanding the nature of the universe. What’s more, they suspect it may hold answers to questions about our own future in the age of climate change… and since this Narnia’s existence is a secret, nobody but the two of them can truly study it. The challenge, of course, is is human entanglements. Sophie has, in San Francisco, an up-to-the-minute super modern life whose many technological conveniences are just a backdrop to what really matters: her parents, and when he chooses to be at home, her brother too. But the longer she stays on Stormwrack, learning about magic and figuring out how to survive an Age of Sail culture and applying her unique skillset to interesting problems for a government that is–very slowly–coming to appreciate them, the more connection she makes there, too. And a lot of those connections come with genetic ties; she gets at least one new family member in every book in the trilogy. Sophie grew up in San Francisco. She loves San Francisco. She loves telecommunications and streaming video and her parents and driving cars and pop music and cheap electric lights and being able to look up just about any fact known, on the Internet, within the blink of an eye. But more and more, she also loves her new home, the sailing vessel Nightjar. She loves its crew – its bosun, Sweet, the ship’s doctor, Watts, its first mate, Tonio (whom she sees as brother-in-law material, though Bram hasn’t quite figured that out yet) and most especially she loves its captain, Garland Parrish. Sophie loves the sense of being around the corner from the next incredible discovery, and the feeling of doing something important, and the self-confidence she found when her homeborn context were taken away from her. Who could give up Wonderland, Oz, or Narnia for San Francisco? How do you make that big a leap? In The Nature of a Pirate, finding a true sense of home is a big part of Sophie’s journey. The rest involves a captured human smuggler, a conspiracy to sink some of the great ships of the Fleet of Nations, and – did I forget to mention? – a tiny matter of accidentally having to plan a wedding. What Sophie finds, ultimately, isn’t tidily bounded. It’s messy. Home may indeed be where the heart is, but our hearts will always be boundless. 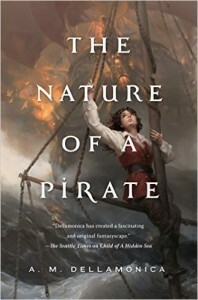 Nature of a Pirate giveaway on Goodreads ends tomorrow! 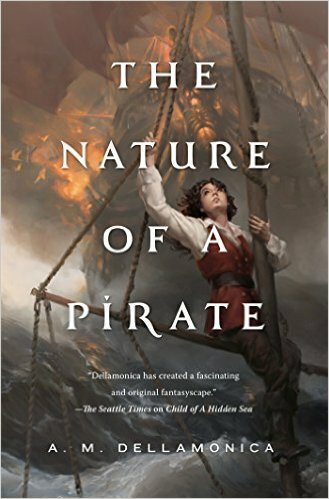 The Nature of a Pirate will be out on December 6th, just over a month from now, and Goodreads is running a giveaway for all of October. This means you have one more spooktacular day to sign up and potentially win one of the five advance copies on offer. But wait–there’s more! What if you haven’t read the first two books in this series? I’m pleased to say Goodreads is also running a giveaway for ten copies of book #1, Child of a Hidden Sea . You’ve got a little longer to get in on that offer–it runs to November 9th. To recap and make it easy. Child of a Hidden Sea Giveaway. The Nature of a Pirate Giveaway. These two books are the first and last in the Hidden Sea Tales trilogy. The middle book, A Daughter of No Nation , won the Prix Aurora for best novel this past year. They feature, collectively and in no particular order, a scuba-diving biologist from San Francisco, tall ships, a magical world that might be a future earth devastated by climate change, handsome sea captains, pirates, spies, murderers, diplomats, swordfights, mermaids in the navy, forensic science, and an international incident caused by a fight over turtle migration. The books are the story of Sophie Hansa, who went looking for her birth family and found them on the world of Stormwrack, and who finds in Stormwrack her professional calling: a world that offers endless mysteries to tempt her boundless curiosity, and whose profligate use of magic is a challenge to her rigorous training as a scientist. They are books where a woman who believes that scientific puzzles are there for the solving delves into the question of magic, and how it can exist at all, on a world whose people mistrust the curious, seeing them as defective at best, spies and troublemakers at worst. To make matters even more complicated, Stormwrack has a perfectly good supply of real spies and troublemakers, people who would like to get Sophie and all of her questions out of the way, so they can get back to the business of trying to rekindle a massive international war. Kelly and I couldn’t be in Calgary last night for When Words Collide, so we were rewatching Forsyte Saga and keeping one eye tuned to Twitter when word came that Kelly had won the Prix Aurora Award for “Waters of Versailles .” Delightful news, and I am thrilled for her (and, I admit, just a bit smug about having used the words “awards-quality” to describe it before it had even gone out to market). About ten nail-bitey minutes after that, we found out that A Daughter of No Nation had won the Aurora in the Novel category. Our brother Bill Robson accepted both awards for us, kindly giving up an evening to hobnob with Canada’s SF luminaries. He called to congratulate us, and sent a pic of himself holding both trophies, both certificates, and our nominee pins. Being nominated for an Aurora is one of those things that I believe all Canadian SF authors aspire to. I always did, so it was a thrill and an honor to be on this shortlist with so many great authors whose work I love. I am thankful to my wife, Kelly Robson, to my family, to the people at Tor Books and to all the many friends and colleagues who’ve helped me, over the years, with everything from research and proofreading to unstinting moral support. Last year, when I had the opportunity to present one of these trophies myself, I was blown away by my good fortune. I feel lucky to be working among such a lively community of brilliant creators, people who celebrate writing, genre fiction, and, above all, each other. I am touched and gratified that you liked A Daughter of No Nation so much; thank you, from the bottom of my heart. This used to be a booming field but has only recently re-emerged. Why is this and how do today’s tropes differ from the ecological dystopias of the 1970s? TV SPOILERS! TW: Character Deaths. Heroine Spotlight and Hidden Sea Tales Giveaway! 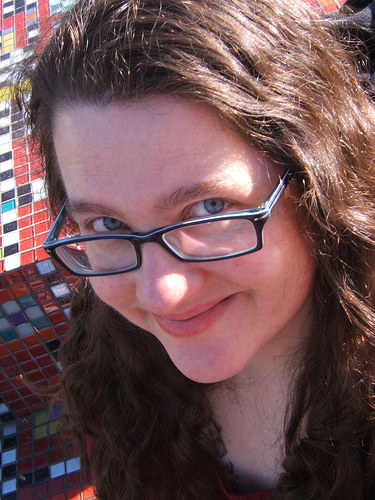 I am happy to say I am the Author of the Month this June at The Heroine Bookstore, an online venture that promotes genre works with female protagonists. There’s an interview with me at the bookstore site and, to sweeten the pot, THB is giving away copies of Child of a Hidden Sea and a A Daughter of No Nation . Entry deadline is June 24th; the winner will be announced the next day. As I write these words, we are at the halfway point between the release of book two, the above-mentioned A Daughter of No Nation and the final episode in the Hidden Sea Tales, The Nature of a Pirate . The third book brings Sophie back into direct conflict with the nations of the Piracy, and particularly with Convenor Brawn of Isle of Gold. With the exception of Issle Morta, Parrish’s monk-riddled homeland, the surviving nations of the Piracy have been frustrated for over a century. They see pillaging on the high seas as an important cultural practice, and they argue that the Fleet’s protection of the smaller and most vulnerable nations of Stormwrack is doing these peoples no favors. Pirates firmly believe in the idea of survival of the fittest… where the fittest are themselves and any country with a navy powerful enough to deter all comers. Many of the big political events since Sophie’s arrival have been caused by the Piracy’s determination to break the Fleet and the treaty that holds it together. Come December, you’ll all get to check out their next big try. Book launch weeks tend to see me gadding about the Internet, and this time is no exception. A.C. Wise, for example, interviewed me this week about, among other things, the writing process that brought me ’round to producing A Daughter of No Nation. This was a particular thrill because I loved loved LOVED her new story cycle, The Ultra Fabulous Glitter Squadron Saves the World Again. Other bits of gadding: Amazon selected ADONN for its Best Books of December feature, and Barnes and Noble featured it in its New Books Round-up. I appreciate a sequel that knows what its readers want, and A Daughter of No Nation definitely knows that we want more swashbuckling sea battles, more wacky biology, and more smoldering Captain Parrish, ASAP. I’ll also note that she is coming out strongly in favor of more swash un-buckling, by which she means she’d very much like for Sophie to get into Captain Parrish’s pants.